Are you in need of an outdoor space upgrade? Calgary Greencrete offers both deck and fencing establishment all through the Calgary zone to refresh your home's outdoor areas. Calgary Greencrete is certain to convey a dynamic component to your outdoor living space that will last for years to come. Give us a call today to get started on updating your space and adding comfort and peace of mind for you and your family—and make sure to ask about their free estimates! 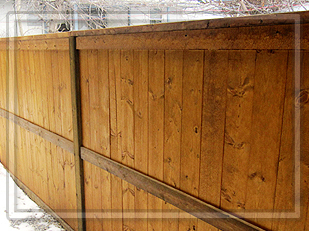 We ensure your fencing or deck establishment is completing right. Calgary Greencrete has always been known for the highest quality of services coupled with exceptional customer service. We understand value is now more important than ever. Our wood work is built using pressure-treated pine and cedar with a wide range of wooden materials. Fences - Serving a variety of functions from privacy to security, our fences add visual appeal to any yard. Decks (All colors and styles) - Intended as the centerpiece for your outdoor entertainment, your deck is the focus of rest and relaxation​. We ​offers several inspiring designs to enhance your own little piece of eden! We know what your yard means to your family. It's your backyard vacation, your outdoor living room, a statement of pride about your home. It says a lot about you, does a lot for you, and it needs professional care to keep it beautiful, healthy and strong.